How To Use Chords To Create Killer Solo’s On Your Acoustic Guitar. A fantastic way to bring your acoustic guitar solo’s to life is to add an element of chords to them. Most guitar players will only think of single notes when it comes to soloing on guitar and keep their chords for rhythm playing. However, chords are a great soloing tool too! There are in fact many ways that you can use chords for soloing on your acoustic guitar, from adding them here and there amongst your single note lines, through to a full blown chord solo. Soloing is all about tension and release. If a solo has no tension and release, it has no appeal, it will sound dull and boring to you and your audience. Including an element of chords in your solo’s is a great way to create this tension and release. It will grab the attention of all who hear you play, and take them along for the ride, as you weave your way in and out of single notes and chords as you solo. Soloing on acoustic guitar can be a major source of frustration for a lot of players out there. This was certainly the case for me when I first started playing. I would sound ok soloing on my electric, but these skills just didn’t seem to transfer over onto my acoustic guitar. I was definitely much more confident soloing on the electric. This went on for some time, and I soon discovered that continuing to just belt away when playing guitar solos on my acoustic, hoping something magical will somehow happen, did very little but add to my frustration. As they say the definition of insanity is doing the same thing over and over and expecting different results. What I eventually discovered was that in order to sound great soloing on my acoustic guitar I was going to need some tools to help me get there. Simply playing notes for the sake of playing notes, albeit in key, wasn’t going to cut it. Imagine a carpenter who has nothing to work with but a hammer. He’s not going to be building much right? It’s the same with soloing on your guitar, if all you have are notes but no real tools to make these notes sound great, then you won’t be creating anything of much substance. One such great tool for soloing, though not an obvious one to most guitar players, is chords. Chords will add a really nice texture to your guitar soloing and sound fantastic mixed in with your single note lines. They will add a whole new dimension to your playing bringing a new life to it. You will feel excited and so much more confident when it comes to soloing on your acoustic guitar now that you have the element of chords to add to the lines you play. Now when I say chords I am not referring to the larger shapes that you generally use for playing chord progressions like open chords and bar chords. These are much too big and clunky and will only clash with the rhythm section of the band. Rather, I am talking about what are often referred to as chord fragments. Chord fragments come from breaking a larger shape up into smaller pieces. They are in fact, as the name suggests, fragments of the full chord form. 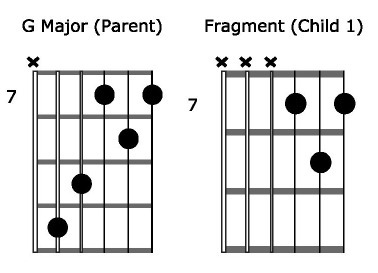 Think of the large chord shape as the “parent” and the smaller fragments that you break it up into as the “children”. If you know which children belong to which parents, then you will have a much more organised way of categorising your fragments on the fretboard leading to you being able to recall anyone one of them at anytime to use in your guitar solo’s. Lets have a look at an example of applying some chord fragments to a solo line . Now we have something with a little more texture to it with the chord fragments adding a whole lot of depth to the line. 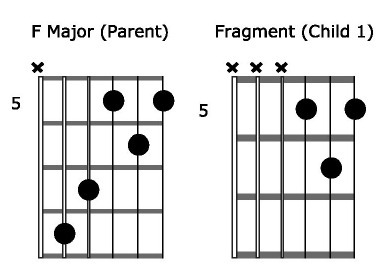 Notice that in the example above, you are approaching your fragments by a fret below and/or above. There are also instances where the chord fragment is being approached chromatically from a few frets below. On a guitar, to move chromatically simply means to move by a fret at a time. This is happening at the end of the 4th bar in the example above. This is just one example of using chord fragments in your solo’s that will create a lot of movement and pump new life into your acoustic guitar playing. To understand exactly what is going on in the example above you need to know where the chord fragments are coming from. In other words, which “children” belong to which “parent”. Here is a break down for you. In the diagrams above you can see the larger “parent” chord form first followed by the fragments (ie. children) that are used in our example, and that belong to that parent chord form. Organising your chord fragments in this way is absolutely crucial. It is the difference between you having all these fragments available to use, in real time, when soloing on your acoustic guitar and not. We have barely touched the surface of what you can do with chords in your acoustic guitar soloing. Download this free ebook and audio and discover 5 cool and easy ways to use chords on your acoustic guitar to really enhance the solos you play.